This the fourth update from Argentina and covers our time on the Valdez peninsula and at Punto Tombo a short distance to the south. We arrived at Puerto Piramides on the Valdez peninsula mid afternoon on the 28th and straight away boarded a whale watching boat similar to this. There are two large sheltered bays on the Valdez, both are calving and mating grounds for large numbers of Southern Right Whales (so called because being slow and floating when dead they were considered the right whales to hunt). The whale watching boats only operate in the southern bay, the whales often approach the boats quite closely allowing great views. We had at least four whales close to the boat including two calves and at about 25 were seen throughout the bay. 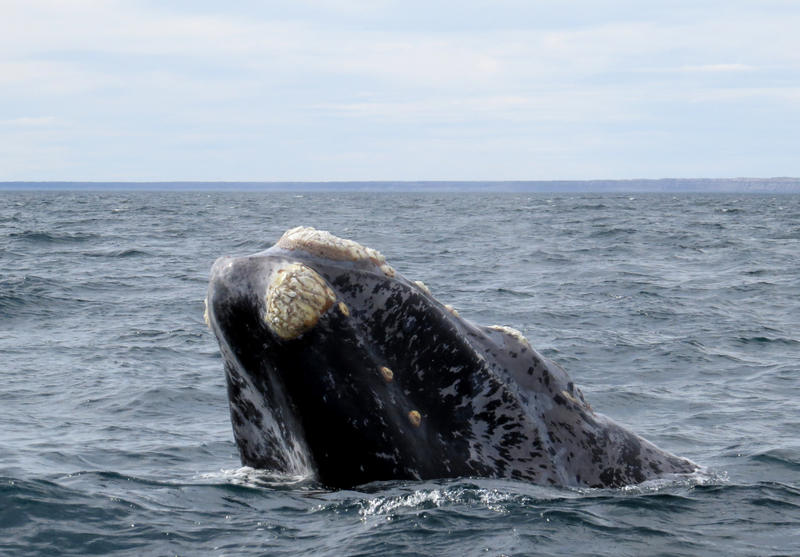 The head and upper jaw of the Southern Right Whales are covered with areas of thickened tissue known as callosities which are even present on the young calves. We were on a boat with about 30 other tourists (thousands of tourists visit the Valdez each year to see the whales) our leader Mark and participant Jim climb to the lookout platform …. …. 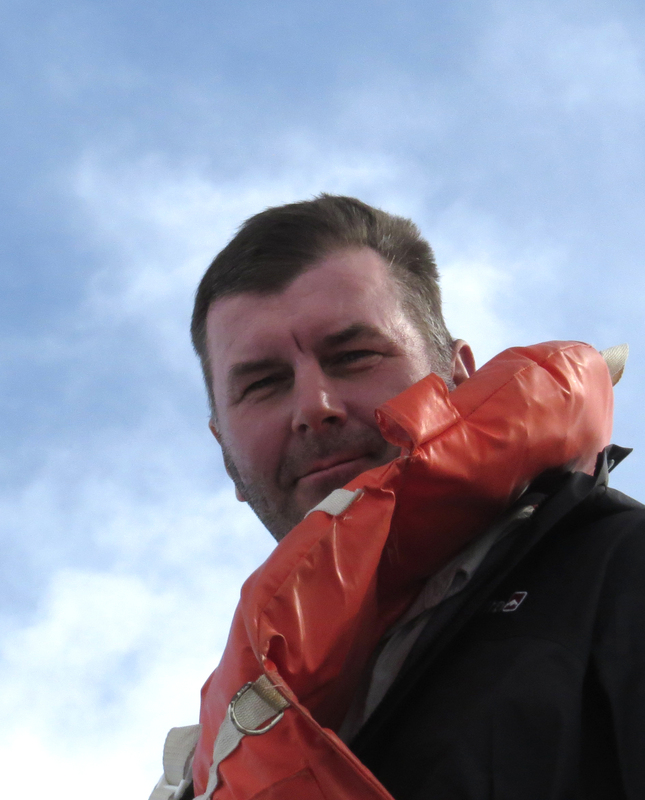 but the captain neglects to tell them that he was returning at speed so they have to hang on for their lives. The following day we drive around the rugged coast of the Valdez. Unfortunately the wind was very strong, at least F7 probably gusting to F8 and it was impossible to stand in the most exposed places let alone use binoculars or a scope. 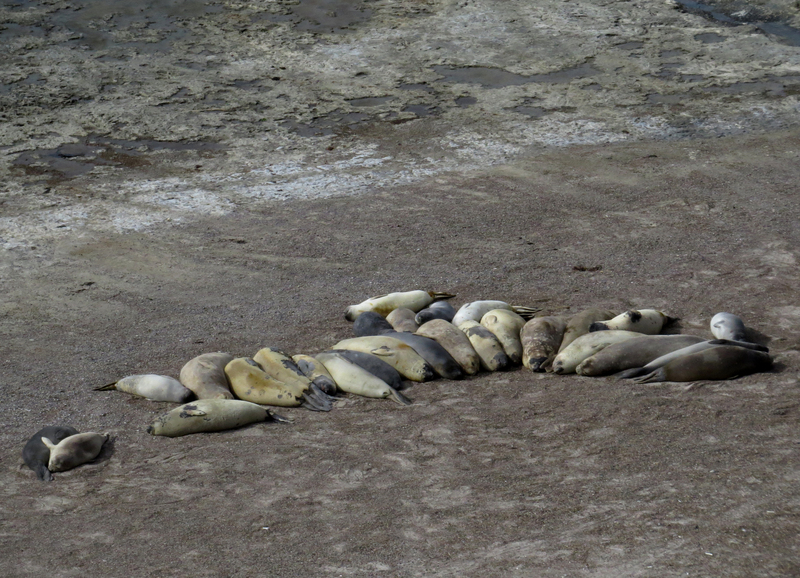 We were able to see this haul out of young Southern Elephant Seals on the south east corner of the island but it was so windy that we beat a hasty retreat. …. conditions weren’t much better. Again only a brief visit was made to this lookout …. …. however we had more success at this sheltered bay. Good numbers of Elephant Seals and a few birds were seen here, however last year the tour watched a party of Orcas (Killer Whales) and one took a seal pub by beaching itself as seen on Attenborough documentaries- no such luck this year. There were a number of Southern Giant Petrels in the area, major scavengers, they can often be seen around seal colonies. A little inland we saw lots of Lesser (or Darwin’s) Rheas …..
….and these Pacas, large hare-sized guinea pigs with white mini-skirts. Unfortunately I was unable to open the window of the bus by my seat and getting in and out was a nightmare due to the wind blowing the door out of your hands, so this photo and that of the rheas had to be taken through the glass. The following day we left the Valdez and drove south to Punto Tombo, a reserve near Trelew. 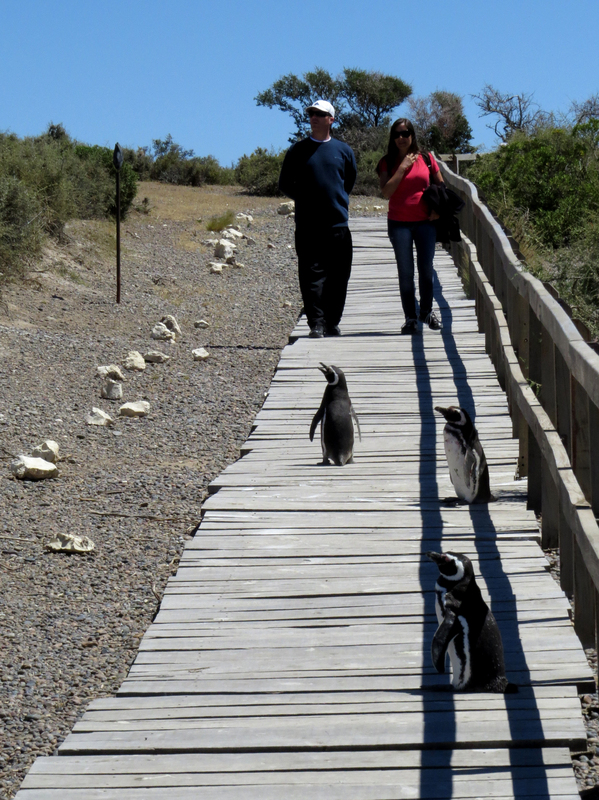 Access through the colony is by means of a boardwalk, this allows the penguins to waddle underneath in places, so it is possible to get very good views without getting in their way …. well that’s the theory. Although there are a million penguins in this colony they are spread out over a huge area and not packed together like some of the Antarctic species. 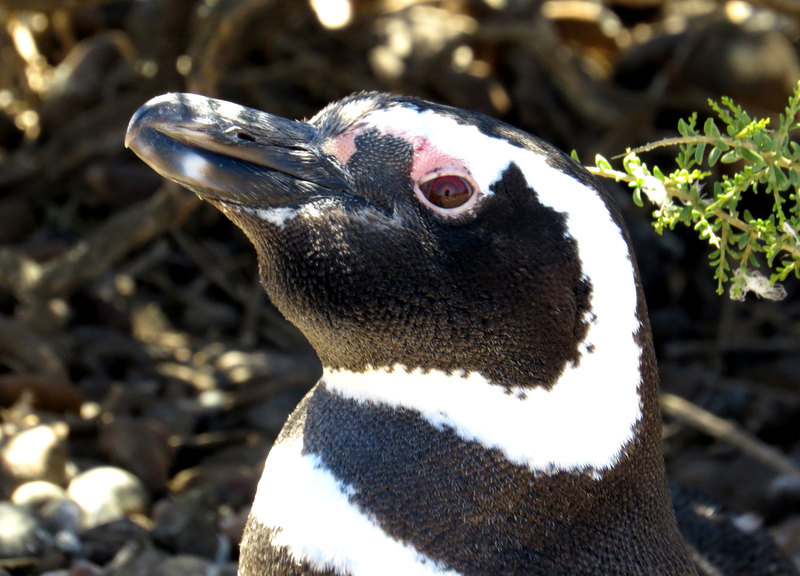 As Magellanic Penguins are hole nesters they have to nest at well spaced intervals. You can even watch them swimming underwater. One of the prime targets in this area was the Chubut Steamer Duck, a flightless species known only from this small part of the Argentine coast. Note the yellow spur on the carpal joint of the (rather stubby) wing of this female. A few Brown Skuas, close relative of our Bonxie, patrolled the penguin colony on the look out for unguarded eggs or chicks. …. as did the ubiquitous Chimango Caracara. 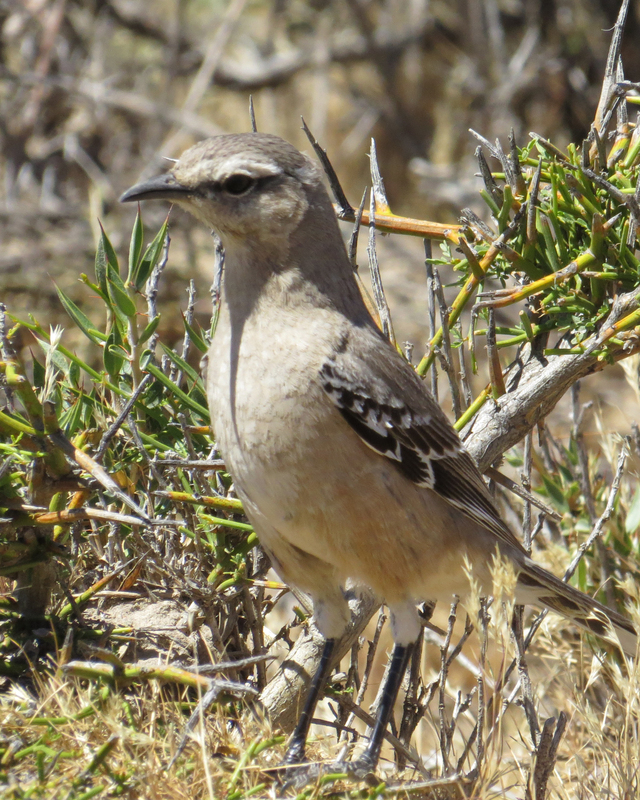 Other birds included Sharp-billed Canastero …. …. and the only Dolphin Gulls of the trip. 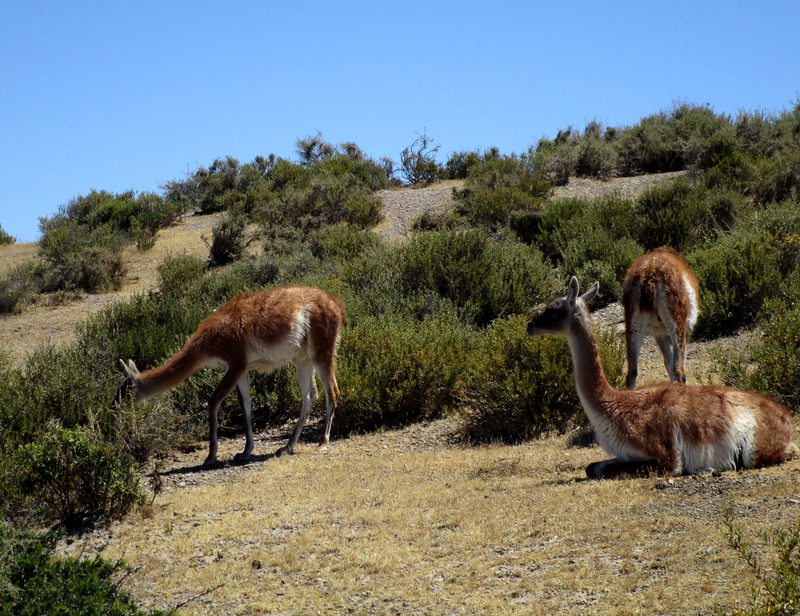 Both the Valdez and the Porto Tombo area are strongholds of the Guanaco, the wild ancestor of the Llama. …. although usually wary, here they fed close to the paths …. …. and allowed close approach …..
…. as did this tiny Southern Mountain Cavy (which was nowhere near the mountains) …. …. 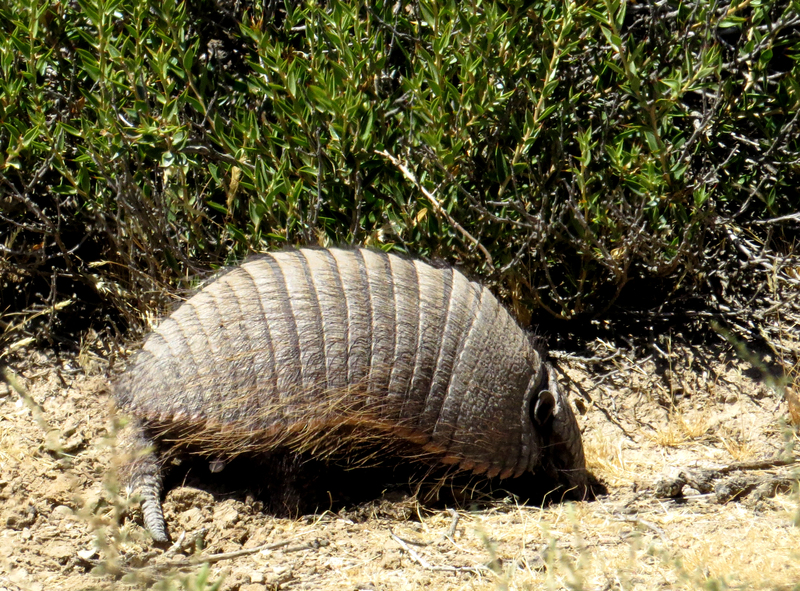 and this remarkable Larger Hairy Armadillo. The day ended with a visit to a rather unsavoury water treatment (= sewage) works, where we had good views of thesse Chilean Flamingos along with a variety of other waterfowl. We stayed overnight in Trelew, the capital of this formerly Welsh speaking part of Argentina. Before going to the airport of our flight to the south we visted a lake in the city where we had good views of Black-necked Swans …. …. and this pair of Silvery Grebes and a Lake Duck. In typical grebe fashion, this White-tufted Grebe carries its chick on its back.